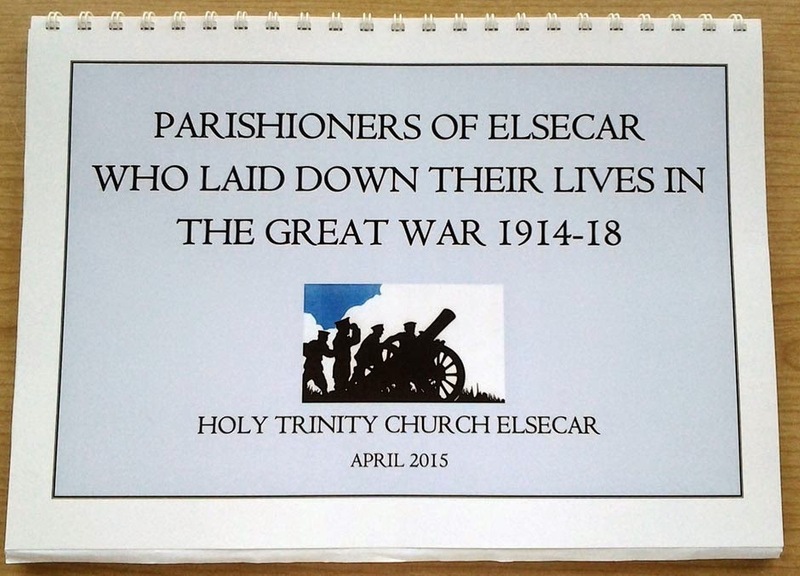 Last week I was given a copy of a new book, Parishioners of Elsecar who Laid Down Their Lives in the Great War, 1914-1918" by its author, Graham Noble, which takes for its starting point the 32 men named on the First World War Memorial plaque in the Holy Trinity Church, Elsecar.. With the assistance of the Elsecar Family History Group a limited number of copies have been printed, but as one has also been given to Barnsley Archives you will be able to consult it there. As it was Easter weekend I actually had the OH to myself for a few days and as I had promised that I would visit the church in Elsecar as a thank you for the book he said he'd drive me down on Bank Holiday Monday and we'd have a look around the churchyard too. 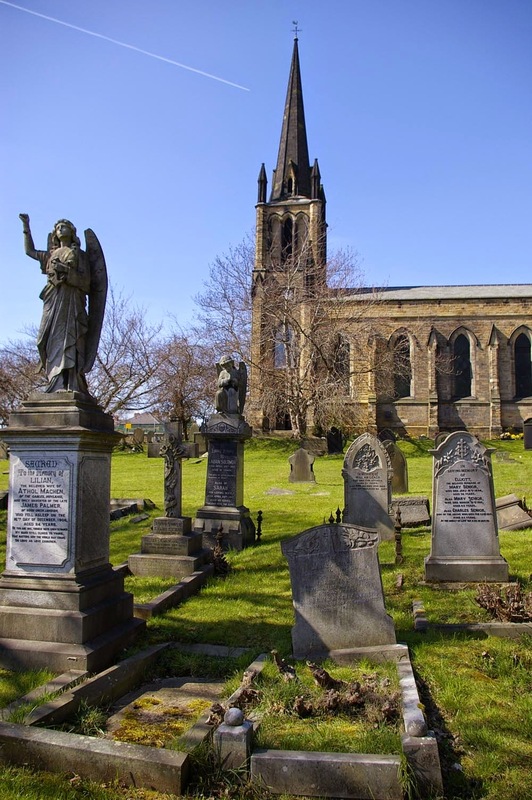 Every Monday Holy Trinity Church, Elsecar is open between 10.30am and 2.30pm for visitors to look around and to consult the vast array of local history and church records they have stored there. Tea and coffee is also available! I had been my reading copy of the book avidly and love the way it is laid out chronologically, intertwining the stories of the men with the greater story of the war. There are maps of battlefields and lots of pictures. Nine of the 32 men named on the memorial plaque have their photos in the book, thanks to donations by relatives. I am sure the church would love to hear from relatives of the the other men too. It has so far not been possible to identify two of the men - H Read and E Turner. Can you help? At the back of the book there are additional stories about men not named on the plaque who are either buried or remembered in the churchyard, or who have been discovered to have some connection to Elsecar, maybe being born there or having family from there. There are reproductions of the memorial postcards from two Elsecar Working Men's Clubs and the lists of men who served from each club, these include many who returned from the war. Finally, a list I had not seen before, from Earl Fitzwilliam's Elsecar Collieries Ambulance Class, which was held in Elsecar Market Hall (now Milton Hall I assume?) from which 43 members had enlisted by November 1915. A piece in the Barnsley Chronicle reported that a total of 472 men had enlisted from the Elsecar Collieries by this time - bear in mind that these would all be volunteers as conscription did not commence until the following year. At the church the OH was greeted by a gentleman who recognised him from the CAMRA beer festivals that are held in Elsecar, and we were offered refreshments. I enquired about the information they hold and was shown a large cupboard full of well labelled folders. The Memorial Inscriptions are in yellow folders and cover both churchyards, old and new, and the cemetery adjacent to the church. I was able to scan through two of the books, the ones for the new churchyard and identify seven potential memorial gravestones, only one of which I had been aware of previously. On my visit at about the same time last year I photographed just three memorials, one in each area of the burial grounds. How on earth had I missed this treasure trove? After a look around the church - the stained glass windows are also a memorial to the Fallen of WW1 - and signing the visitors' book, we ventured across the road to the new Churchyard. The OH had captured the plan of the plots from the back of one of the folders on his phone camera as my sketched diagrams seemed unlikely to help too much in our search! Well, I wasn't expecting to be looking for so many gravestones. Unfortunately the reasons for me not finding some of the other men soon became apparent. Reginald Naylor (killed in action 6 November 1917) is remembered on a kerbstone and it will take another visit with a spade or trowel to remove sufficient grass to be able to photograph his memorial. 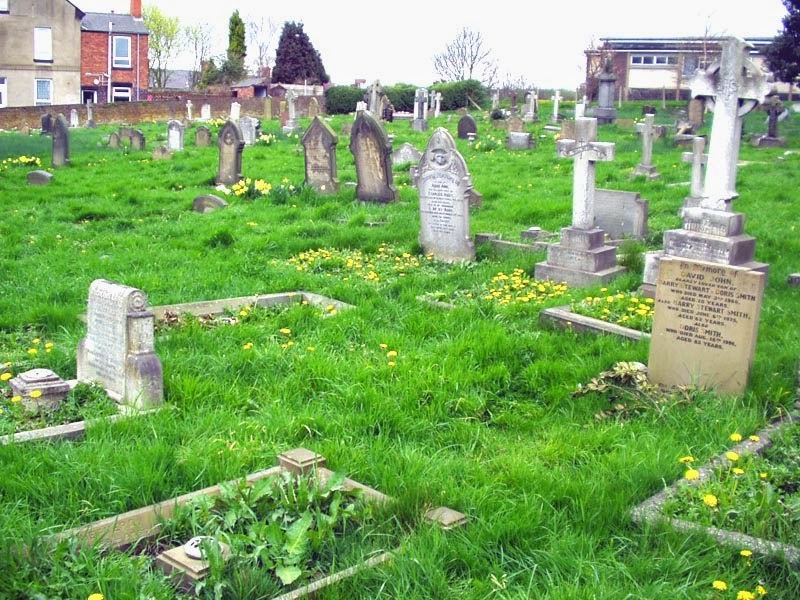 Clifford Portman's family gravestone (he died of wounds on 28 September 1917) and Wilfred Hirst's family gravestone (died in hospital in France on 2 April 1918) have both fallen on their faces across the grave plots. Poor Percy Turner's family gravestone (killed in action on 15 April 1918) if still intact, now lies beneath a hedge at the back of the churchyard. But my only excuse for not finding Ernest Whittlestone's memorial is that the ground at the very bottom of the churchyard was very boggy last year, so I did not venture that far, because, now I know what I'm looking for I can actually see it on the left of the photo above that I took last year over the churchyard wall! We also found two WW2 war memorial gravestones, only one of which I had been aware of previously, and photographed a stone in the older part of the churchyard which appears in the book, Fritz Harry Leach (killed in action 23 April 1917) which I really should have seen on my last visit. Ah, well, the OH's pictures with his 'proper' camera are always so much better than mine anyway, so it was well worth the trip. And it was a lovely sunny day as you can see in this photo on the left, which includes some rather scary 'weeping angels' (if you follow Dr Who you'll know what I mean!) at the bottom end of the old churchyard. 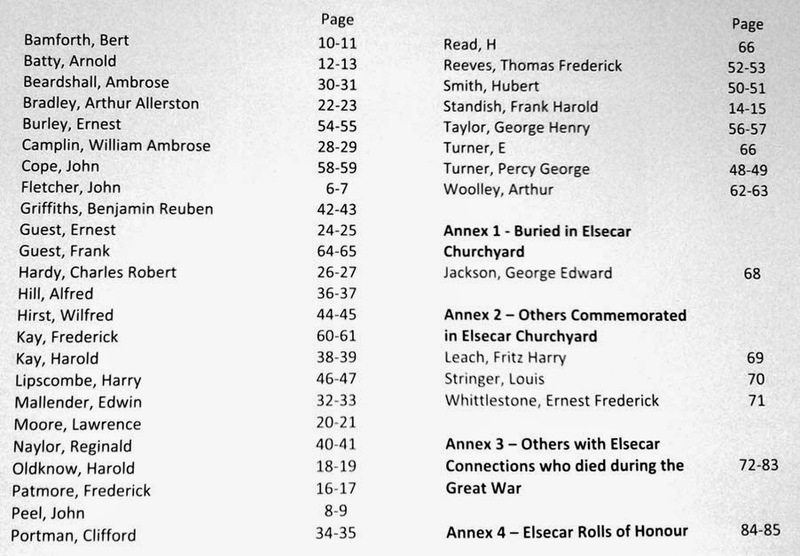 I have added the names and information to an index page for Elsecar's War Memorial Gravestones and hopefully either myself or ML will be able to add individual pages with more information in the fullness of time.